JULIA SPENCER-FLEMING: I've been a fan of G.M. Malliet since her first DCI St. Just mystery, the Agatha-award-winning Death of a Cozy Writer. Deb Crombie and I were both thrilled to have the chance to read and blurb the first book of G.M. 's new series, the quirky-yet-traditional Wicked Autumn. It has a handsome, single vicar (and former MI5 agent), an airy fairy neo-Wiccan, an iron-fisted head of the Womens' Institute, squires, schoolteachers, surgeons, seductresses - what's not to love? If that's not enough for your village-mystery-loving heart, Wicked Autumn is stuffed with maps, character lists, and - well, I'll let G.M. tell you herself. I have just sent in the completed manuscript of the second Max Tudor mystery novel. As with my previous novels, the email went out with at least five or six attachments, the extras being “front matter.” Front matter includes all the very important “stuff” such as the dedication of the book, perhaps a quotation that captures the theme of the book, and the acknowledgements—applause for the people who in some way or another helped the author. Other front matter, in my case, includes a table of contents (my chapters have titles) and a cast of characters. I grew up reading Agatha Christie novels and to my mind, no book is complete without these additions, these warm-up exercises that set the stage—these “old-fashioned” touches that I believe are actually coming back into fashion, since they are so much a part of the art of storytelling. Who could resist reading on, knowing that a story contains a character named Rosemary Barton, Agatha’s “beauty treated to a beastly death” by cyanide cocktail, or Vera Claythorne, the “ex-governess with a Coroner’s Inquest in her past”? Or a chapter called “Gossip,” and another titled, “The Stain by the Wash-stand.” This sort of thing signals you’re in Christie-land, and to me is as crucial to the enjoyment of her books as a fireplace, a shawl, and a pot of tea. And the maps and diagrams! In a Christie, these are often included somewhere in the midst of the story. 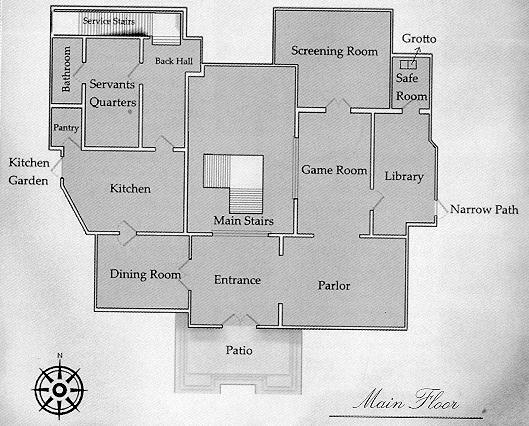 I think my heart starts to race every time I turn a page and come across something like a diagram of Roger Ackroyd’s office, so crucial to the solution of that crime. Two of the three books in my St. Just series contain a map or schematic. Even Stieg Larsson, not exactly a cozy author, employed these devices—The Girl with the Dragon Tattoo contained several nods to Christie’s books, including a family tree and a map of Hedeby. The map was not included in the English translation and it really needed to have been. I don’t believe there was a descriptive cast of characters, either, which would have helped, since everyone in Sweden is apparently named Berg, Berger, or Bergman. I sent my first Max Tudor mystery (Wicked Autumn) to my editor with a hand-drawn map of my fictional village Nether Monkslip attached. My version of this map would have made any third-grader proud, but it did orient the reader and help create that “sinking into the story” feel. Fortunately, my editor agreed it added to the story, and decided to hire Rhys Davies to redraw the map into something magical—it was used to create the endpapers for the book. Rhys, who is from Wales, told me it reminded him of his own village back home. It is completely charming. 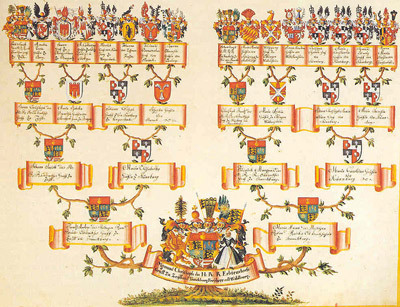 The Max Tudor book I just submitted has a family tree, which helps the reader sort out the family Footrustle. I’m hoping someone will again turn my amateurish effort into something beautiful. You can read an excerpt of Wicked Autumn (and play with the interactive maps!) at G.M. 's website. You can friend her on Facebook or follow her on Twitter as GMMalliet. Gin, your book is indeed wicked--wickedly witty, sly, and clever. And speaking of irresistible, who could resist a character with a name like Max Tudor, who is an MI5 spy turned Anglican priest? The book is delightful, and I LOVE the map. So glad the publisher did that for you. And lovely to see you at B'con! I should admit that you look gorgeous.The post is great! I love, love, love the map--how lucky that your publisher embraced it! I bet the family tree will make the cut too. Looking forward to this book! For my first golf lover's mystery in 2002, we had the idea to include a glossary of golf terms. I'm afraid it frightened non-golfers half to death, so it was moved to the back of the book in the four books that followed. I love the add-ons! I know that some writers like to collect visual inspirations (does the villain look like Daniel Craig? ), but I'd prefer to visualize characters without help. But! the additions you include are something else entirely, and let the reader follow your story more easily without interfering with his or her investment in the characters or plot. In my most recent book I included a sketch of the sampler that is the key to the story, because there was no way to describe it adequately with words. Does how it turns out sometimes surprise you? Does writing it--give you insights? Deb - Getting the unexpected chance to have tea with you at Bouchercon is one of the reasons I go to these conventions. A great pleasure! Thank you for the kind words. Do you know what's funny? I can no longer recall how I arrived at the name Max Tudor. Now I can't imagine him called anything else, of course. Man - merci very much. Lucy - the glossary sounds like a great idea - I can see how it could daunt intially, tho. Sheila - I love the sampler sketch idea! You're right, sometimes you have to show, not tell. Hank - even though these days I know where I'm headed with the plot, the surprises along the way - well, they surprise me. I always read every single page of the front matter, including the copyright page. Always have. 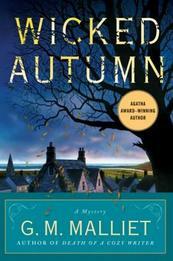 Gin, I'm sold and just ordered Wicked Autumn on Kindle to take on our fall trip. You've entertained me since your first book and I'll keep looking forward to more highjinx in Nether Monkslip (fabulous name!). I absolutely love front matter. I tried to persuade my publisher to let me do a map of Llanfair in my Cosntable Evans books but they said no. I had to fight to get a glossary of Welsh words, but got a lot of messages that these were appreciated. Good luck with the book, Gin. Ann - Thank you - so glad you've enjoyed the books. Rhys - Yes, the Welsh glossary is a wonderful touch, and helpful. It's a beautiful language like no other. As a mapaholic, I LOVED this GM! Cara! So good to see you here. Thank you! Love maps in books! Love flipping to them, reminding myself "oh, yes, that's there," and wondering "hmm, that was a long walk on a cold night -- is she the killer?" and such things. They add so much to the experience of the place! Or, to borrow my captcha word, they help "synch" my experience to the author's vision! It probably goes back to the whole idea of the treasure map. Didn't we all love those as children? My sincerest thanks to Jungle Reds for their phenomenal support!